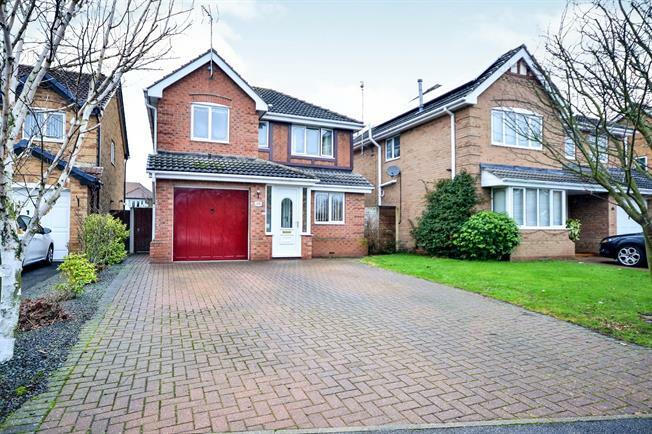 4 Bedroom Detached House For Sale in Sutton-in-Ashfield for Guide Price £210,000. No chain on this immaculately presented four bedroom detached family home on a small modern development with no through traffic ideally placed for A38 and M1 access. The property has a double width driveway, integral garage with internal door into the hallway, and an enclosed rear garden with patio, lawn and gorgeous Breeze House. Internally there is an entrance hallway, dining room, lounge with gas feature fire and rear bay with French doors to the garden, a downstairs WC, and a kitchen overlooking the garden. Upstairs there are four bedrooms, all with built in storage, an en-suite to the master, and a family bathroom. UPVC double glazed door. Double glazed uPVC window. Tiled flooring, wall lights. UPVC double glazed door. Single radiator, karndean flooring, built-in storage cupboard. Double glazed uPVC window with frosted glass. Single radiator, karndean flooring, tiled splashback. Standard WC, vanity unit with inset sink. UPVC French double glazed door. Double glazed uPVC window. Gas fire and double radiator, ornate coving, wall lights. UPVC double glazed door. Double glazed uPVC window. Single radiator, karndean flooring, ornate coving. Roll edge work surface, wall and base units, one and a half bowl sink with mixer tap and drainer, electric oven, induction hob, overhead extractor, space for washing machine, space for fridge/freezer. Loft access. Double glazed uPVC window with frosted glass. Single radiator, built-in storage cupboard. Double glazed uPVC window. Single radiator, a built-in wardrobe. Door to en-suite. Double glazed uPVC window with frosted glass. Heated towel rail, vinyl flooring, part tiled walls. Low flush WC, single enclosure shower, vanity unit and inset sink, extractor fan and shaving point. Double glazed uPVC window. Single radiator, built-in wardrobes. Double glazed uPVC window. Single radiator, fitted wardrobes, built in wardrobes. Double glazed uPVC window. Single radiator, built-in storage cupboard. Double glazed uPVC window. Heated towel rail, vinyl flooring, part tiled walls. Standard WC, panelled bath, shower attachment over bath, vanity unit with inset sink, extractor fan. Block paved double width driveway for two to three cars leading to an integral garage with a wall mounted light to the front wall. There is a lawn garden with feature tree and a path to the left hand side of the property leading through a gated access to the rear garden. The rear garden has a patio area with outdoor tap, wall mounted lights and external power socket. There is a lawn garden with gravel section beyond with inset shrubs, external lighting on a timer, a shed and a beautiful Breeze House which has a built in heater, power sockets, lighting and awning surround for all weather use.